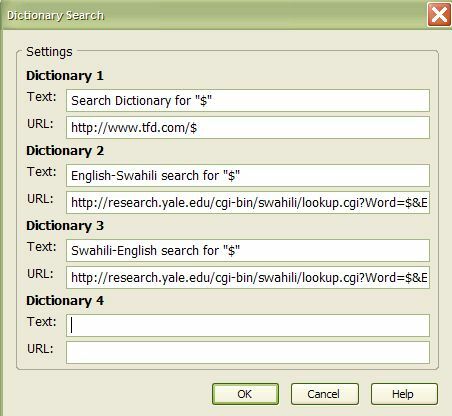 Look up Swahili words directly from your Firefox web browser! 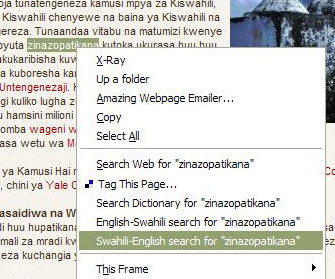 By following these simple steps, you can look up any word in the Swahili-English or English-Swahili dictionaries of the Kamusi Project, simply by clicking your mouse. Note: We would be delighted to release this as a stand-alone Swahili Dictionary extension, pre-configured for Kamusi searches. If you have the skills and interest to code this Mozilla extension as a volunteer, please contact us! Step 1: Make sure you have installed a current version of Firefox. 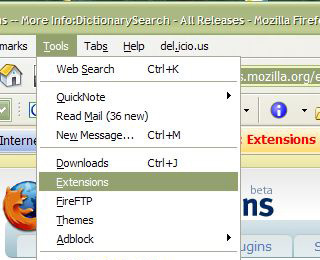 Step 2: Open up Firefox and download the DictionarySearch extension - go here and click on "Install Now". Step 3: Close Firefox, and then start it again. Step 4: Select Tools from the option bar, then choose Extensions from the Tools menu that opens up. Step 5: A box will open up that lists all of your extensions. 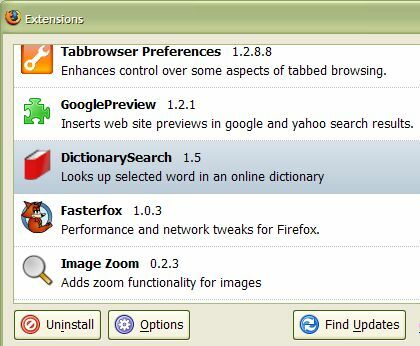 Find the line for DictionarySearch, click on it once, and click "Options" on the bottom of the box. Text: English-Swahili search for "$"
Text: Swahili-English search for "$"
That's it! Now, use your mouse to highlight any word on any web page, in English or Swahili. Right-click your mouse button, select whether you want to look up your word from English to Swahili or from Swahili to English, and you will be directed immediately to a search of the Kamusi Project dictionaries for your term.